ARGHAKHACHI, April 4: The family of Sita Tharu of Padini Rural Municipality in Arghakhanchi district was thinking of migrating to the plains due to acute water crisis in the village. Since many others did so, this family also wanted to follow suit. According to Tharu, the greatest problem in her locality has always been that of water. “I have no any pleasant memory related to water. Collecting one bucket of water takes hours. It has been so since my childhood. Sometimes, we don't have water for days,” she reminisced. “Ours is a dry place. 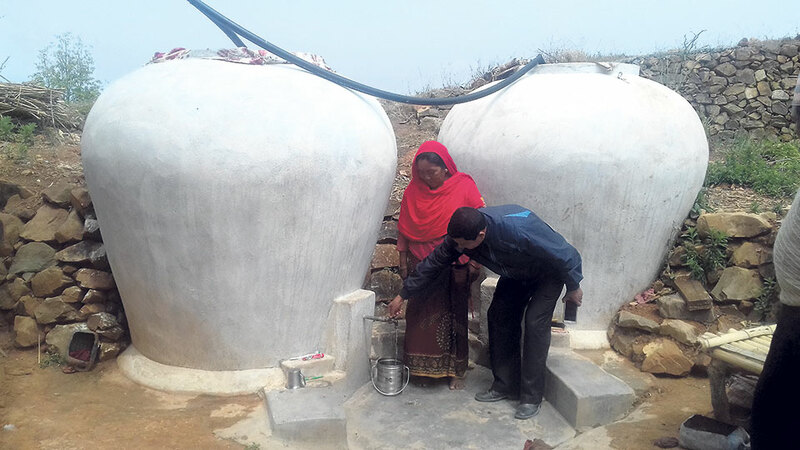 Water crisis is a common problem in the hills,” she added. Now, the scenario has changed a bit. Though water is still not sufficient, the shortage is not that acute either. With the aid provided by Poverty Alleviation Fund, the Marginalized and Indigenous People Development Council has constructed water tanks for the locals. This huge tanks store rain water which has given a great respite to the people. 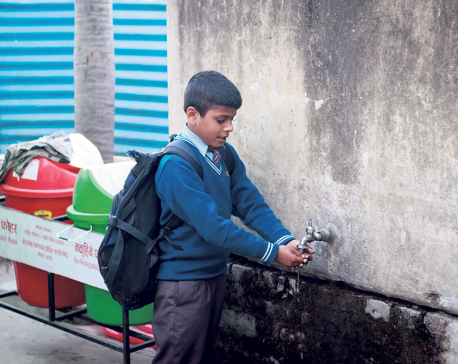 “My entire morning would be spent just for collecting water. I had to go far away to fetch water. Sometimes I had to return home with empty bucket,” said Tharu. “I even used to engage my children for the same job. Their studies have been hampered a lot,” she added. With the water tank right in front of her house, she is a 'rich' woman now. At least, that is what she feels. “When your biggest tension is taken away, you feel great. Right now, we are feeling the same. So much so that we have stopped thinking about migrating from here,” she reported. Water crisis in towns and villages of Arghakhachi is very common. With natural water sources drying up over the years, this problem has only deepened further. Though proper studies have not been done over the causes of disappearing water sources like streams, ponds and rivers, environmentalists put the blame on climate change. Reports indicate that water sources in hills, mountains and plains are fast vanishing. “When we were kids, there were rivers nearby. Those rivers have now turned into dry land. Similarly, few streams and ground water are found in the villages. Even if you dig, no matter how deep, there is no water,” she said. The villagers were quite happy when they received taps at home. But running water was again a problem. “The government gave us taps and pipelines were laid. But what is their use when you get no water from there? Water is supplied once in a blue moon. We carefully store it for drinking purpose,” she said. Now, it has been a few months that she is not under stress. Rain water gets collected in the tank. As everyone knows the 'value' of water, it suffices for several household as well as to feed cattle. “We use the water to take bath, wash clothes, feed cattle and so on. We are quite relieved,” she said. “Instead of spending hours to fetch water, now we have time to go out, work and make some money,” she added. While water tanks have eased life in the villages, women living with prolapsed uterus are happier. According to them, the tank technology given them a great respite. “I used to feel severe backbone pain and more in my uterus. Doctors had said that I had uterus prolapse,” said Goma Devi Saru. “Now with no need to go far way to fetch water, we are quite relieved,” she added. Saru is just one among dozens of women in the villages with problems related to uterus. Some are getting treatment, some are not. Some have even removed their uterus during mobile surgical camps in the villages. However, now, with the tanks 'appearing' before their houses, all those women are quite happy. “It seems to me that the biggest reason of our poor health is the water shortage. Having to do very hard labor to collect water took toll on our health,” noted Saru. “Doing the hard work every day, without a single day off is tedious,” she added. The council has constructed 80 tanks so far -- two tanks for each household in the municipality. Each tank has a capacity to store 2,000 liters of water. Other tanks are under construction. According to the Project Manager Lil Bahadur BK, the council is not only building tanks but also helping the people by providing soft loans. “Apart from the plan to ease water problem, the council is helping people by providing soft loans for cattle farming and other types of income-generating activities. This is certainly impacting their lives,” he said.